The constant evolution of health care is shaped by innovation, legal mandates, and employment metrics, something that makes the profession exciting and challenging. However, the ultimate goal of providing optimal care that benefits patients remains unchanging. It’s up to highly qualified health care professionals to adapt to the following health care industry trends to meet this goal. The current trends shaping the modern health care landscape affect care delivery in different ways. Some point to a growing presence of technology that aims to make care delivery more efficient for both providers and patients. Others are driven by changes in policy. 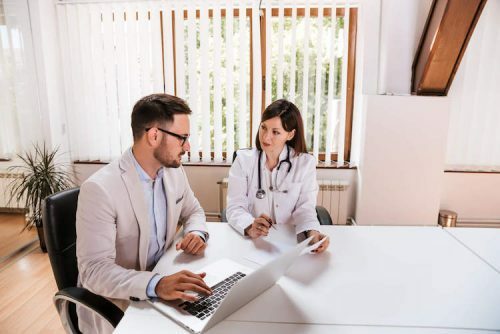 These modern fluctuations are occurring at a time when the industry is facing a dearth of physicians equipped to handle the changes, increasing the need for professionals with advanced degrees in related fields, such as a Master of Health Administration. One of the most prominent ways technology is being utilized in health care stems from data gathering. The combination of the industry’s growing comfort with technology and the increased sophistication of data gathering systems is making it easier for health care professionals to analyze intricate health data and share the results with their patients. This is leading to the creation of highly individualized patient care strategies that can result in more efficient solutions that uniquely benefit patients in both short- and long-term scenarios. It has therefore become more important for health care administrators to have sharp fundamental technical skills that can allow them to take advantage of this ongoing trend. In the practice of value-based health care, physicians and hospitals receive payment based on patient health outcomes. The goal behind this emerging trend is to promote a team-based health care delivery system that creates a higher level of accountability while encouraging patients to adhere to short- and long-term health strategies. By essentially incentivizing outcomes, care providers are theoretically charged with coming up with care plans that encourage patients to follow proactive health measures that can reduce out-of-pocket expenses. Ultimately, the value-based model strives to reduce health care spending through healthier living. The increased utilization of data gathering models isn’t the only way the health care industry is infusing new technologies into its strategies. A growing number of facilities are applying artificial intelligence and machine learning to a wide range of essential health care concepts, from creating predictive models of short- and long-term patient care strategies to using robots that can assist in surgical procedures or aid in medication delivery and other tasks. Facilities are also investing in tech to increase efficiency within health care administration, including billing, fraud detection, and risk management. These investments coincide with a greater opportunity for positions that combined health care knowledge and technological acumen, such as health informatics. Government policy will continue to have an effect on health care delivery, as evidenced by the Affordable Care Act. In 2019, health care administrators must account for fluctuations in monthly premiums and subsidies, as well as a wider range of insurance options as they oversee their facilities’ operations and care delivery strategies. They must also be prepared for potential changes to the ACA in the coming years, which may include alterations to 2019’s new mandates. This may create a greater need for qualified health care administrators who can interpret these fluctuations efficiently without causing a disruption in patient care. According to a 2018 report conducted by the Association of American Medical Colleges (AAMC), there is a potential physician shortfall on the horizon. The AAMC projects a shortage ranging from around 42,000 to 121,000 physicians by 2030. Factors pertaining to supply and demand drive this projection. For instance, the AAMC predicts an 11 percent population growth by 2030. It also projects the number of Americans over 65 to increase by 50 percent by that time. Moreover, more than one-third of today’s physicians will hit retirement age in the next decade. These statistics underscore a pressing need for highly qualified physicians to enter the field. It also points to a need for health care administrators with the knowledge and skills to deliver optimal care in the face of this shortage. The health care industry’s constant changes require skilled individuals to properly identify industry changes and adapt in order to keep patient care processes running smoothly. Earning an advanced degree in a related field, such as a Master of Health Administration, can equip students with the fundamental skills needed to optimally handle these changes. For example, a Master of Health Administration program focuses on helping students develop technological and analytical competencies as well as soft skills, such as communication. As a result, graduates may be able to not only make sense of changes but also properly implement them in a way that strengthens a facility’s fundamental health care delivery.